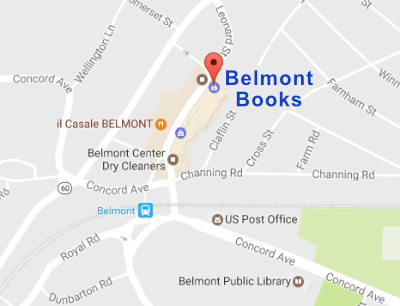 Belmont Books is at 79 Leonard Street in the heart of historic Belmont Center, near Didriks and The Toy Shop of Belmont, and just down the street from the fabulous Craft Beer Cellar, Il Casale restaurant and Rancatore's Ice Cream. Detail of Belmont Books in Belmont Center. 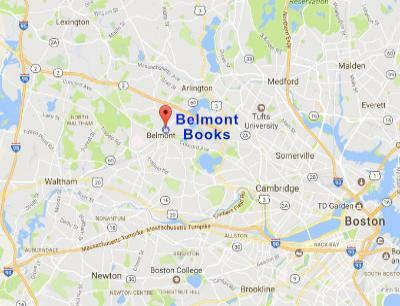 Belmont Books location in map of Boston area. Take Route 2A West to Fresh Pond Parkway. At the Fresh Pond rotary, go 1/2 way around and get on Concord Ave. Follow Concord Ave. 3 miles. After Claypit Pond, the athletic fields and the Belmont Post Office, you will come to a crazy intersection with Common Street. The little yellow Wellington Station will appear on your left. The current train station will be on your right, a stone structure with a bridge going over the road. Turn right under the railroad bridge and proceed straight onto Leonard Street. Belmont Books will be at the far end of the shopping area, near Foodies grocery store. Follow signs to Route 2 East. Take Route 2 East to Exit 59 - Route 60/Pleasant Street. At end of long exit ramp, turn right onto Pleasant Street. At 2nd light, turn left onto Leonard Street. Belmont Books will be after the fire house, on your left, next to Foodies grocery store. In Boston, exit onto Storrow Drive West. Continue several miles past Harvard Square exit, then follow signs for Arlington/Cambridge to exit and merge onto Route 2A/Fresh Pond Parkway. Go a few miles. At the first rotary, go 3/4 of the way around to stay on the Fresh Pond Parkway. At the 2nd rotary, go 1/2 way around to get onto Concord Ave. Follow Concord Ave. 3 miles. After Claypit Pond, the athletic fields and the Belmont Post Office, you will come to a crazy intersection with Common Street. The little yellow Wellington Station will appear on your left. The current train station will be on your right, a stone structure with a bridge going over the road. Turn right under the railroad bridge and proceed straight onto Leonard Street. Belmont Books will be at the far end of the shopping area, near Foodies grocery store.